The town of Kuala Selangor is located at a distance of 20 km from Kuala Lumpur. This town, which is the capital of a district bearing the same name, is known for its popular attraction,the Kuala Selangor Nature Park. 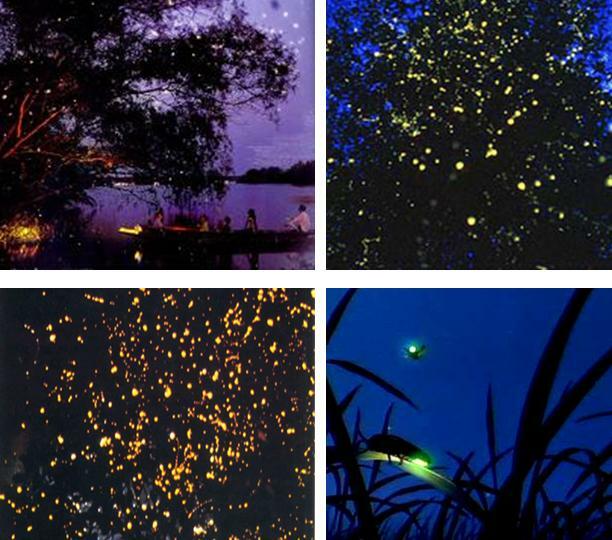 However in addition to the nature park, Kuala Selangor also attracts hordes of tourists year round for another reason- the stunning sightings of the ‘Kelip-Kelip’ or fireflies, which inhabit the river banks of the Selangor River, in and around the small, fishing village of Kampung Kuantan. ‘Kelip-Kelip’ which translates as ‘twinkle’ ‘twinkle’ in English, is the term used in Bahasa Malaysia to describe fireflies. At this moment, it must be mentioned that fireflies are not flies at all but are tiny beetles, which belong to the Lampyridae species, one of the oldest species of the insect kingdom. Various boat operators in Kampung Kuantan offer thirty-forty minute-long boat cruises along the River Selangor to enable tourists to take in the wondrous sight created by these colonies of fireflies. There is no particular season that is conducive to firefly watching as the fireflies are present in Kuala Selangor all throughout the year. The fireflies are best viewed between the nighttime hours of 8pm and 11pm. Fireflies can’t be easily seen on full moon or rainy nights as they are not at their luminous best at this time. Boat cruises on the Selangor River tend to get very crowded on the weekends so it’s best to go mid-week. Booking for the firefly cruises is at the booking office in Kampung Kuantan. It is advisable to bring along mosquito-repellent and anti-itch cream as mosquitoes abound on these cruises. If you must bring a camera please don’t use the flash as it scares away the fireflies. Kuala Selangor is one of the only two places in the world where fireflies are found in abundance. The other popular locale for firefly sighting is along the Amazon River, in Brazil. Malaysia being much closer to India, why not plan a trip soon to see this awe-inspiring sight?